Welcome to OBridal (also known as Occansey Designs). We have been creating handmade custom wedding veils for brides all over the world since 2002. We offer each bride the opportunity to select the exact length of her wedding veil, the edging and embellishments desired on her wedding veil, even the type of comb the bridal veil is attached to. 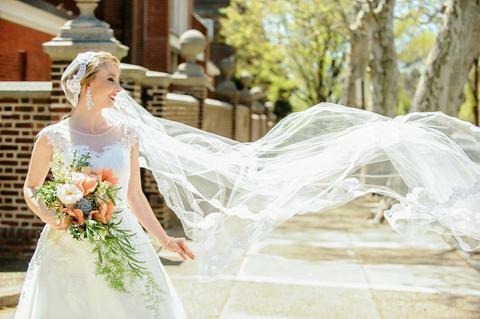 Whether you are searching for the classic Cathedral Veil, a Lace Mantilla Veil, a Drop Veil, or a short and chic Shoulder Veil - we can create the Custom Bridal Veil of your dreams just for you! Melt my heart! 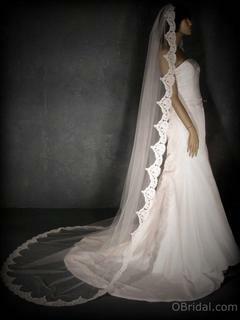 Only one available of this all Lace French Alencon Wedding Veil. Complete your breathtaking bridal look with the perfect handmade wedding veil from OBridal. From Lace veils, face veils, cathedral veils, to veils that extend down the entire aisle - we can custom make a bridal veil just for you. It's your special day. You derserve a handmade wedding veil just for you! One of the season's hottest trends - Wedding Veils with a Horsehair / Crinoline edging. Shoulder Bridal Veils with a length up to 24" long. Be sure to check out our Testimonials to see pictures of our bridal veils in action on real brides! Complete with descriptions, they may help you find the look you are dreaming of!